The New England Nursing Informatics Consortium (NENIC) invites and requests nominations of individuals for the Rita D. Zielstorff Leadership Award. 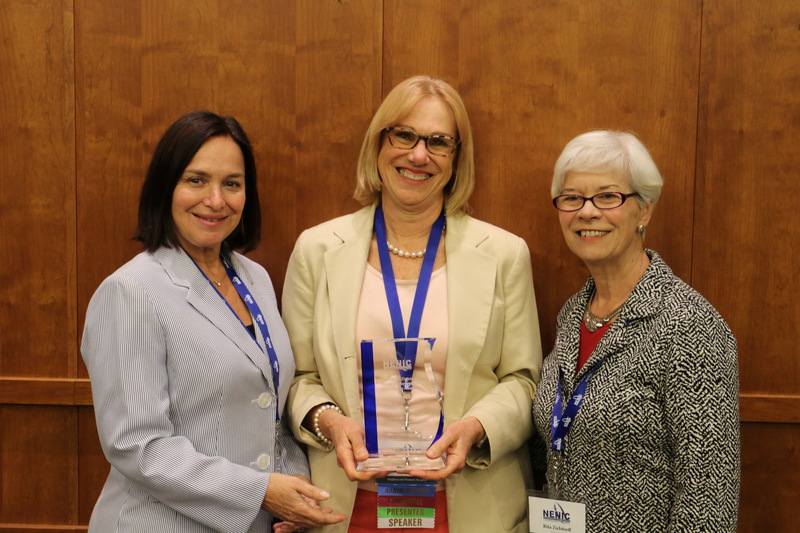 This award recognizes a NENIC member who exhibits exceptional leadership and provides an outstanding influence on the discipline of nursing and contribution to the field of nursing informatics in the spirit of Rita D. Zielstorff. Deb became interested in information technology early in her career. While in clinical practice, she took on the responsibilities of the Boston VA surgical intensive care unit (SICU) as system manager for Phillips CareVue. In this role she managed the flowsheet based clinical information system from the 1980’s until 2002. Her responsibilities included technical support, system configuration and staff training. Deb was promoted to a departmental management position where her responsibilities and contributions continued to grow. She was responsible for administrative support to inpatient and outpatient care across the VA three-campus integrated facility. Her responsibilities included managing surgical and safety programs, active committee work (Accreditation, External Peer Review, Medical Center Medical Records [Co-chair]) and managerial roles. During this time, she was also responsible for implementing an OR scheduling system across 2 campuses enhancements to the VA E.H.R. (CPRS), as well as implementing upgrades, training, and reports. Her leadership was recognized and rewarded when she was asked to be the Boston VA representative for the Collaborative Learning and Process Improvement team at the Institute for Health Improvement. She worked with National VA groups working to reduce surgical site and hospital acquired infections. After retiring from the VA, she continued her work in informatics at the Brigham and Woman’s hospital as a Nursing Informatics Project Manager for their Acute Care Documentation initiative. She was instrumental in the design and configuration of content associated with iMDsoft- Metavision electronic flowsheet implementation supporting multiple clinical workflows across two academic medical centers in the Partners HealthCare System. Deb was perfectly situated within the BWH Nursing Informatics department as Partner’s began it’s EPIC journey. Deb utilized her informatics experience and expertise to work across the system development lifecycle (design, configuration, testing, training and implementation). She was the nursing lead for BWH flowsheet content development, screen design, and very importantly medical device integration. She worked closely with the biomedical engineers mapping variables from dialysis machines, physiologic and fetal monitors to EPIC, and then training nurses on how best to manage data that flows directly from medical devices into a patient’s EHR. In the years that followed the Epic implementation at BWH Deb was tireless in her commitment to improve the system for clinical nurses. She remained on the frontlines, listening to the stories and frustrations of nurses as they developed their own skill in using the system. She brought their concerns and suggestions back to the analysts and developers and worked together to make the improvements that were very much needed. It was her knowledge of HIT combined with her clinical experience and her ability to work closely with other members of the team that led to her significant contributions in this very complex HIT implementation. Beyond implementation and optimization Deb focused on how best to utilize the data that was now available to all nurse in the department, both clinical and administrative. Using her knowledge and experience from her Quality work at the VA Deb assumed responsibility for writing reports out of Epic and for teaching nurses how to access and understand these reports. Deb became a “go to” reporting expert within nursing at BWH. More recently in her Nursing Informatics Project Manager role Deb has assumed responsibility as the nursing lead for the secure message system communication initiative. In this role Deb will once again call on her informatics knowledge and experience to influence the project to help insure its best outcome. Deb has been active in mentoring nurses in many roles. She was a guest faculty at the VA National Center for Patient Safety (NCPS). In this role she worked across multiple VA sites to improve communication and patient safety. She has been a Clinical instructor at Regis College. She has also been a sought-after Guest Lecturer at Northeastern University and Simmons College. Deb has had been involved and held many leadership positions in professional organizations (BANIC, NISCNE, NENIC, HIMSS). Yet it is her commitment to BANIC/ NENIC, as well as her professional contributions, that make her especially deserving of this award. Deb has been the treasurer of the organization since it’s inception. Deb, along with the Board, have helped this organization grow it’s assets to a level that assures its continued growth and survival. She is key in maintaining our web presence in her role as our site system administrator. Process workflow as a basis for testing and training. Deb’s most significant contribution in the field of nursing informatics, and she is an excellent recipient of this award because of her tireless and sustained commitment to teaching and mentoring clinical nurses in how best to leverage HIT with the goal of improving health outcomes for all of our patients. Give a brief biographical summary of the candidate. Explain how the nominee actively supports the NENIC mission, and makes outstanding contributions to the educational and leadership principles for which NENIC stands. Describe how the nominee has demonstrated leadership in nursing informatics and/or engaged in the advancement of the best use of information and management systems for the betterment of healthcare. Please include a recent resume or Curriculum Vitae of the nominee. Nominations are open now through March 30th, 2019. The award recipient will be selected by the NENIC Board of Directors and will be announced at the annual Trends in Clinical Informatics: A Nursing Perspective symposium on April 2019 at Waltham Woods.